Wake up with the invigorating spray or wash away the stress of the day. Showers have become the place to pamper and refresh. A shower can be as simple as a shower control and shower head, or a home spa complete with water fall, multiple shower heads, body spray and steam. Step 1: Which Shower System? 2 Valve shower can only run one function. One handle each to control the hot and cold water. This shower offers both pressure and temperature control. This system does not meet codes in most states where requirements indicate anti-scald. 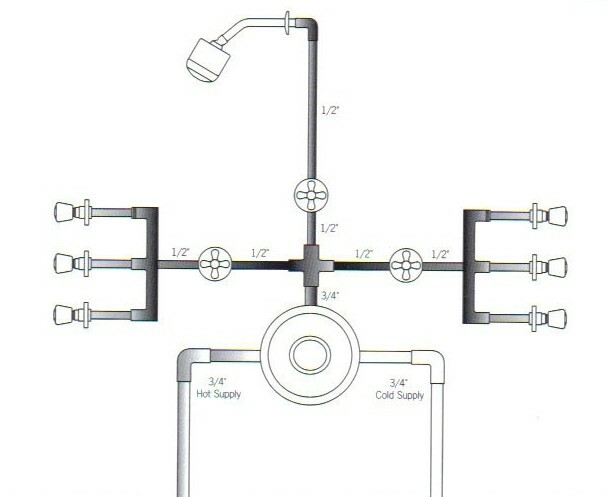 3 valve shower system gives the choice between two functions. There is a handle for hot water, one for cold, and one to switch the water between the two functions. 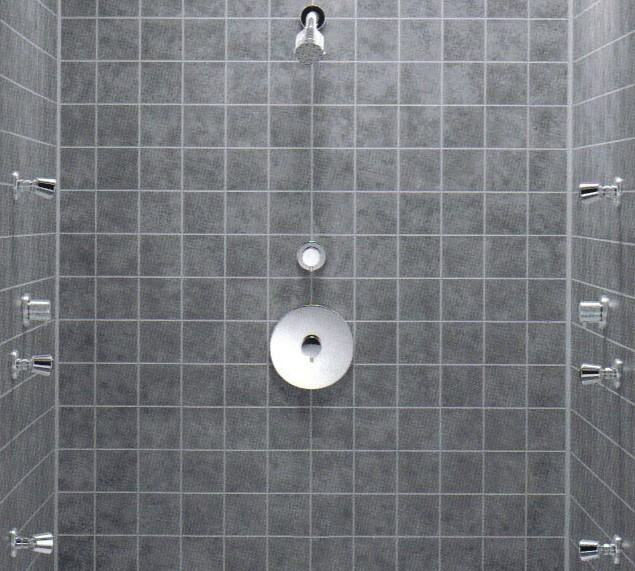 Mostly used for a tub & shower system, it can be installed to accommodate a hand shower and shower. This shower offers both pressure and temperature control. It does not meet codes in most states where requirements indicate anti-scald. Pressure Balancing valves balance incoming hot and cold water pressure to compensate for fluctuations in water flow. If the cold water pressure decreases, the valve senses this and reduces the hot water pressure. (It will protect the user from drastic temperature changes should a toilet be flushed while showering.) A single handle is used to turn the valve on and to go from hot to cold. Whether the handle also controls water pressure depends on the particular control. Some are not variable; as soon as you turn the handle on it is at full pressure. Others, the more you pull the handle the more pressure. Pressure Balance control with a diverter has the same properties as the pressure balance valve listed above with the addition of a diverter. User can choose between two functions. 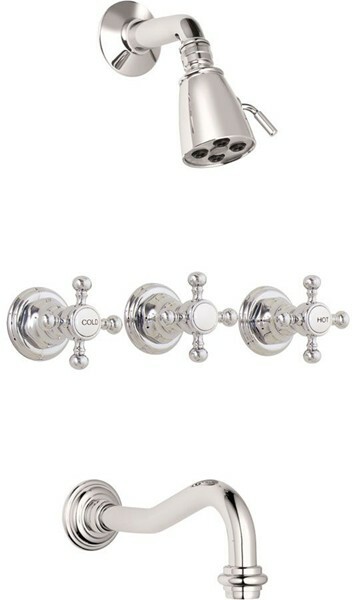 Often used as a tub shower combination faucet, this system can also be used with a shower head and hand held shower. Thermostatic valve allows users to select a favorite temperature and keep it there regardless of changes in the temperature of the hot or cold water supply. It has a sensor that reacts to changes in temperature caused by either pressure or inlet temperature changes. It allows for a higher water flow for multiple outlets: shower heads, body sprays, hand showers etc, as well as the ability to have multiple functions on at the same time. 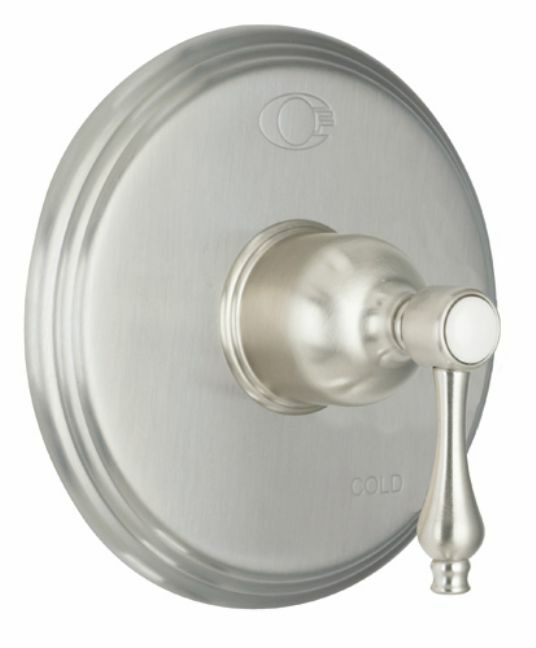 Thermostatic valves are available in 1/2" and 3/4". The thermostatic valve sets the temperature, a stop valve (volume control) is need to turn the water on & control the water volume. One stop valve is needed for each function. Stop valves are also available in 1/2" and 3/4". The number of outlets or functions possible depends on the maximum flow rate of the valve at the given water pressure. 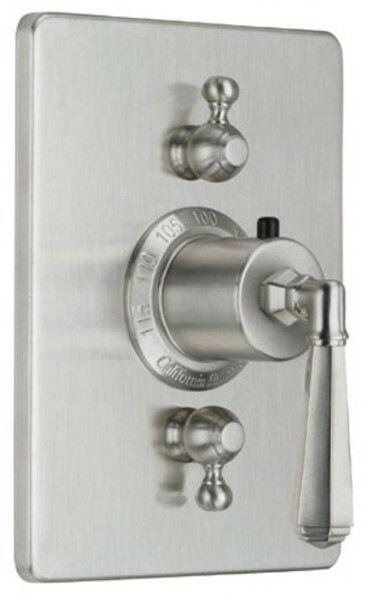 For example a California Faucet 3/4" thermostatic valve has a flow rate of 19.8 gpm at 60 psi. Three body sprays at 2.5 gpm, a large shower head at 7.0 gpm and a hand shower 2.5 gpm = 17 gpm. A valve of 19.8 would handle these 5 outlets. There are 2 -3 parts of a Shower Head. The shower arm dictates if it is a wall mount or ceiling mount shower. Body sprays are usually installed in groups and are designed to spray the entire body. They are usually positioned at shoulder level, waste/hip and thigh/knee. Different jets offer different features like pulsating, self-cleaning, adjustable volume or directionally adjustable. Nebulizers produce a fine mist. 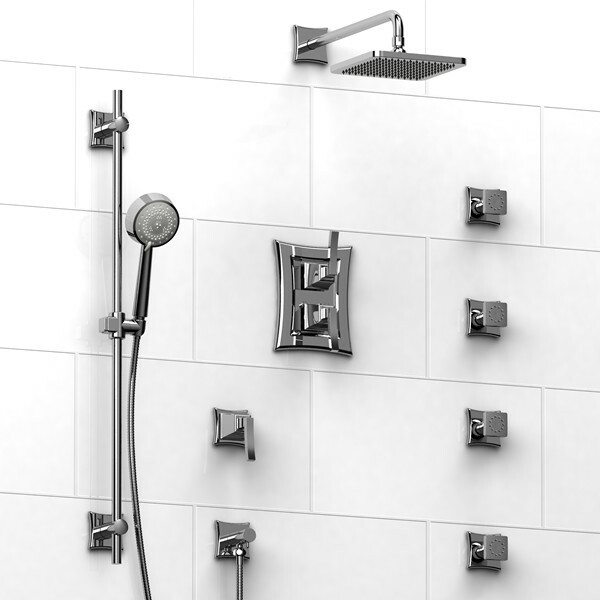 Also known as Personal Showers, hand showers can be mounted on a slide bar or bracket. 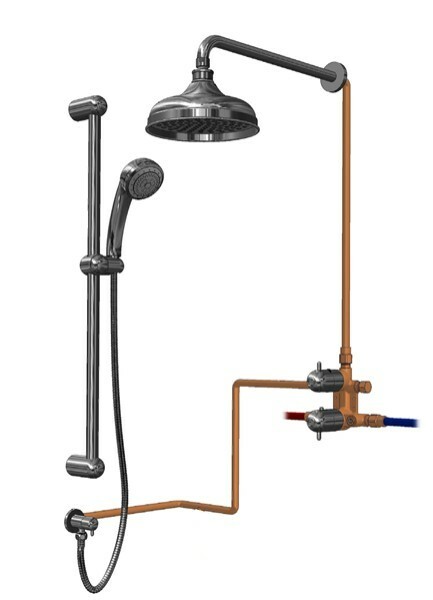 The Hand Shower set consists of a Slide Bar or Hook, Hand Shower, Hose and Supply Elbow (connects from the water supply to the hose). The height is adjustable along the slide bar. The hand shower can also be removed from the slide bar. A hook holds the hand shower. The picture shows the wall supply (where the water comes into the hose from behind the wall) and the hook as two separate pieces. There are also a models available that have the wall elbow and bracket as one piece. We do not have a separate page for tub spouts but they can be added to create a custom thermostatic tub & shower system. Tub spouts with an integral diverter can be used with a pressure balance control for a tub/shower combination. The addition of steam shower doesn't change the controls need for the shower, the steam is controlled by its own set of controls. We are including it here since it is a great addition to any shower. Now that you know what you are looking for, it is time to shop. Or, if there are questions - give us a call 866-380-0303. Each of our faucet companies offer great quality shower faucets. 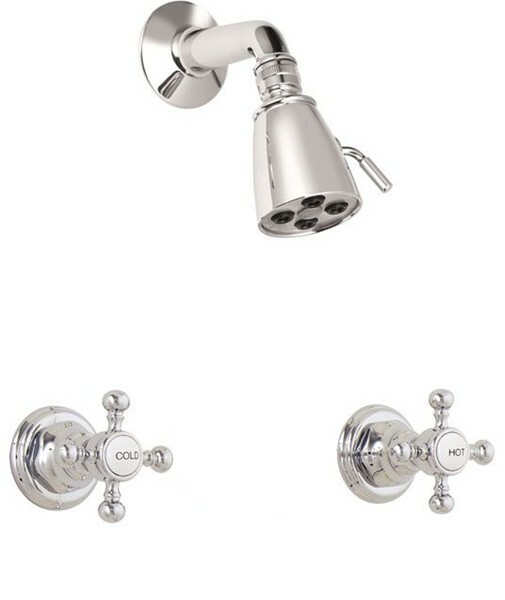 Explore the looks of each series by looking at the widespread faucets on the main page. Find a faucet you like the looks of, click on it and you will see all the offerings - including shower controls. Don't forget the shower drain!